Humble Student of the Markets: Can the market advance continue? Watch China! The US equity market has risen more or less in a straight line since the Zweig Breadth Thrust buy signal of January 7, 2019 (see A rare "what's my credit card limit" buy signal). 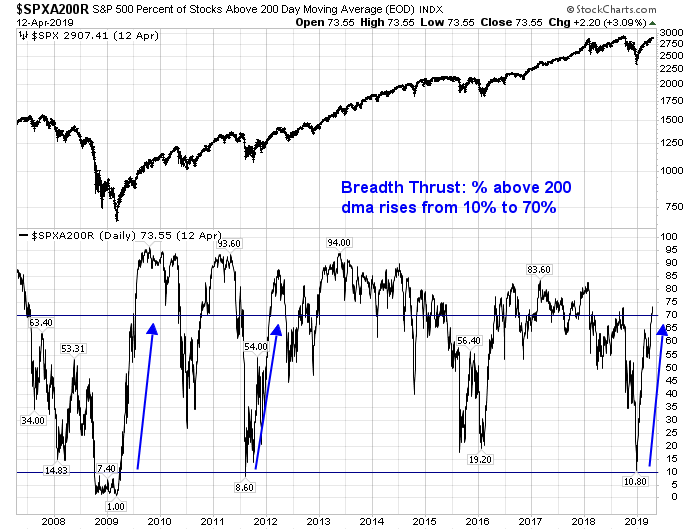 Technically, breadth thrusts are extremely rarely long-term bullish signals. How far can stock price rise from here? Chris Ciovacco made a recent video which studied the market behavior of breadth thrusts that came to a bullish conclusion. 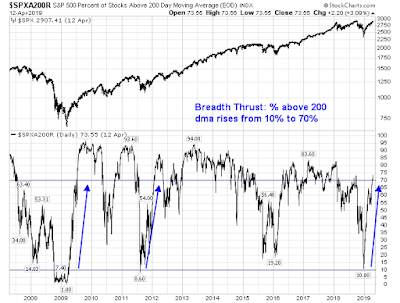 He defined a breadth thrust as % of stocks above their 200 dma rising from 10% to over 70% in a short period. This has happened only twice in the last 15 years. The first time was the rally off the Lehman Crisis bottom of 2009, and the next time was the eurozone Greek Crisis of 2011. Ciovacco pointed out that the current breadth thrust occurred more rapidly than either 2009 or 2011, which is a sign of bullish price momentum. He went on to outline the bullish market performance in the wake of these breadth thrusts (warning, N=2). Can history repeat itself? Do current fundamentals support further market strength? Here is an "out of the box" answer to the question of further market strength: Watch China.